Fans who are still a bit skeptical about the prospect of Harper Row becoming the next Robin may wish to avert their eyes; while Scott Snyder told an audience at WonderCon today that the character wasn't planned to take over for Damian Wayne when he created her, it's hard to escape the fact that she seems destined to be filling a similar role. "Harper wasn't designed with the purpose to be Robin," said Snyder during DC's All Access panel. "She was designed to give a different lens on Gotham. Because I felt like I wanted to create a young woman as the main character for those story lines, that's where she came from. 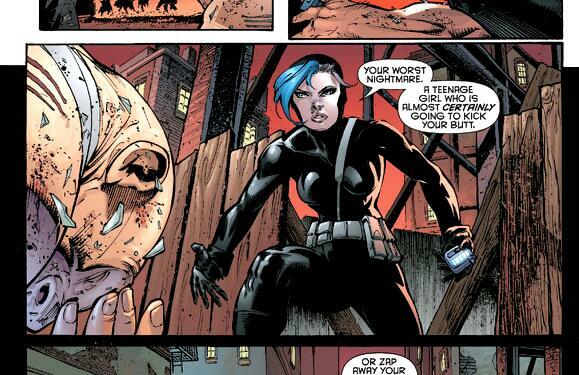 Without directly addressing who she's going to become, she's a big part of my personal mythology for Batman." Some fans, of course, are excited to see her come in as Robin while still others are expecting her to take a more Stephanie Brown-style approach to heroism, existing on the outer fringes of the Batman family.